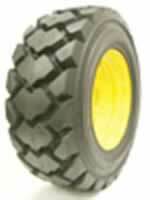 The "Hulk" has a unique tread pattern that allows it to operate in severe applications while providing superior self cleaning action needed for use in soft soil applications while providing superior self cleaning extion needed for use in soft soil where the "King Kong" many not be appropriate. With 44/32nds tread depth and a solid to void ratio of 68% solid to 32% void compared to a 45% solid and 55% void found a normal R-4 tires. Because of the fantastic tread depth and solid to void ratio the Hulk L-5 will provide extraordinary hours of service in all conditions. The Hulk L-5 tires are made with nud breakers that help to clear away mud from the void area of the tread. The "Hulk" is available in a super wide version, called "bulky Hulk", for those operations that require greater carrying capacity or enhanced flotation. Using the Hulk L-5 tires with Galaxy's "Poly Soft Super Fill" will result in our famous "No Downtime - Cradle to Grave Tire System"!